Both Michael Brown and Chandra played a Catalan type of structure, and surprisingly both of them had a slightly better position against Ruifeng Li and Andrew Tang respectively. Tang chose to force some complications, which favored Chandra; but, in time trouble, Chandra could not find his way in the complications. After the time control, both players agreed to a draw in an equal position. In the other game, Brown had a slight advantage, but Ruifeng Li, with good strategic moves, gradually equalized. The live commentators, Alejandro Ramirez and Cristian Chirila, were expecting a draw around move 30, but Ruifeng had different plans! After some shuffling of pieces, Ruifeng sacrificed a piece with 38…Nxf4!? which was objectively dubious, but kept the game going. Brown wasn’t impressed and managed to stabilize his position. Brown could have collected the point with 54.Rc5! and Bc3!, but he inexplicably wasted precious tempi with 51.Kg2 and Kf3. Those two tempi was all that Ruifeng needed, and he comfortably forced a draw after starting a pawn-avalanche with the moves g5-g4! The leader, Kayden Troff, faced Bovey Liu with black. 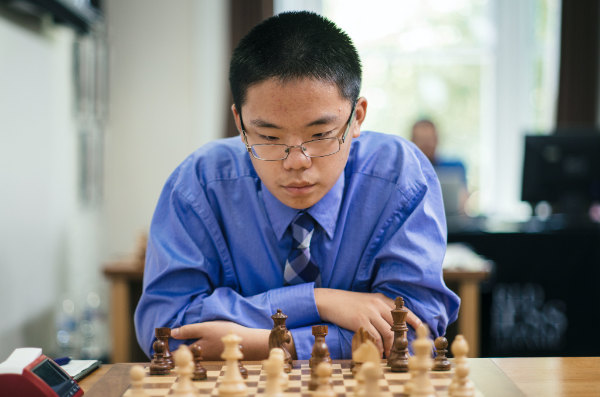 Bovey Liu decided to avoid mainstream Najdorf theory, and played Bb5+. He did not manage to surprise Troff, as after the clever intermezzo, 14. dxe5 c4!, it was Troff who was calling the shots. After that, Troff soon captured the bishop-pair and a pawn and soon after, the game! Troff can be happy with his play as his nearest rivals Liang and Checa are trailing him a full point behind! The biggest matchup of the day was between Emily Nguyen and Akshita Gorti. Gorti was chasing Nguyen with a half point, so she had to do her best to catch up to Nguyen. They followed the game played by Wesley So against Duda, but Nguyen made the inaccurate move 10…e4 and followed it up with the dubious Qh4. Gorti took some time to find the reply, but after her accurate Bb5+, Nguyen’s position crumbled. Nguyen fought hard afterwards, but her position could not be saved. With this win, Gorti took the lead from Nguyen. 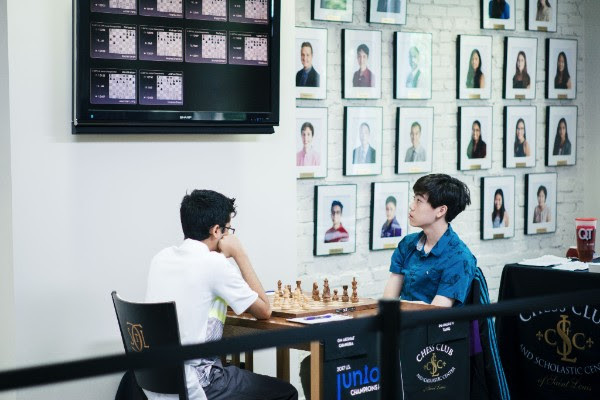 In the Junior Championships, it’s important to keep on fighting as upsets can happen, and after accumulating some points here and there, you might find yourself on the top of the scoreboard! That is precisely what happened to Maggie Feng and Annie Wang. Annie Wang played a positional 5.Bg5!? variation against Bykovtsev. Bykovtsev tried to untangle her position, but Annie Wang was playing really well today, and after some great positional moves (15. g4! , 26, f3!) she managed to outplay her opponent! With this win, Annie Wang is in near contention for first place! Speaking of big winners, Maggie Feng, who celebrated her birthday yesterday, didn’t give any chances to her opponent today! 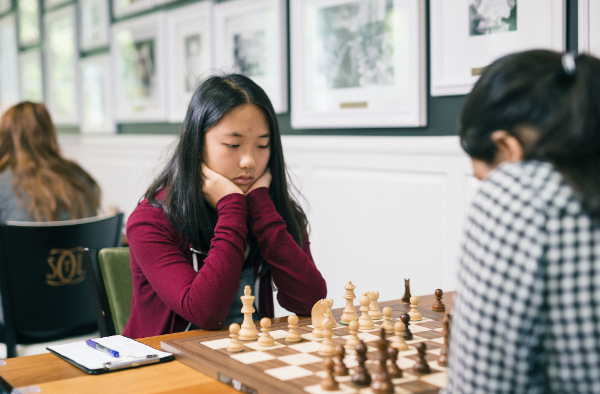 Maggie Feng was playing Thalia Cervantes and the opening featured the g3 Gruenfeld, which positions are well-known from the famous Karpov-Kasparov matches. 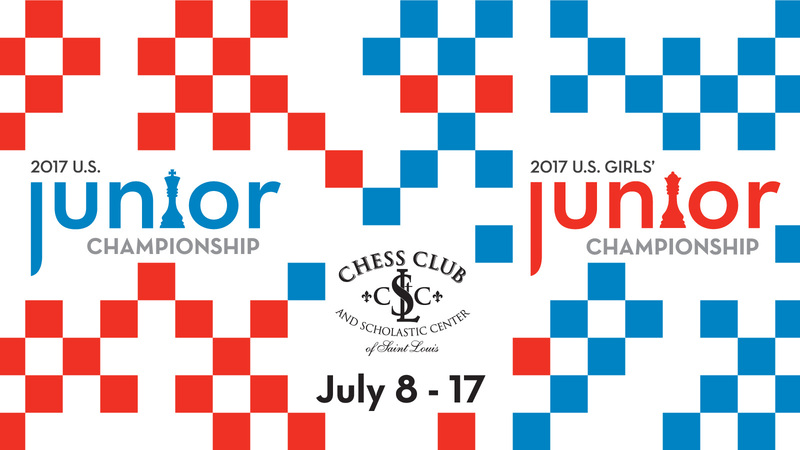 Maggie Feng played extremely precise chess today, her moves 15. Qb3! and the prophylactic 16.Rc2! made a deep impression. Thalia Cervantes tried to untangle, but today Maggie Feng proved irresistible. 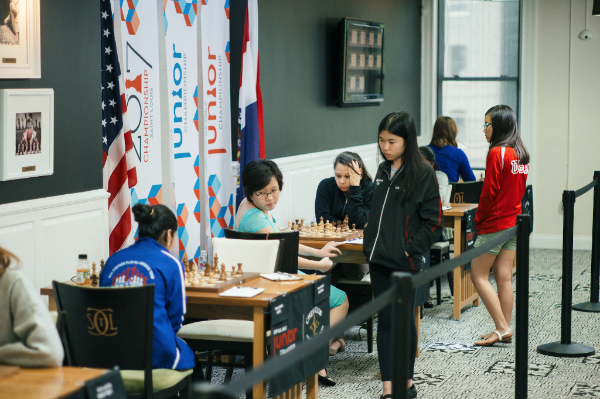 Maggie Feng won the game on move 33, and now she is a mere half point behind Akshita Gorti! Troff is leading the Open Section with a full point lead ahead of Liang and Checa, while in the Girls’ Section, Gorti is half a point ahead of Nguyen and Feng. Tomorrow is a rest day, but play will resume Friday.